Single Axles are standard on all Arrow Front® feeders. 8 ton capacity on 12', 16', 20' and 24' Arrow Front® feeders. 10 ton capacity on 30' and 36' Arrow Front® feeders. 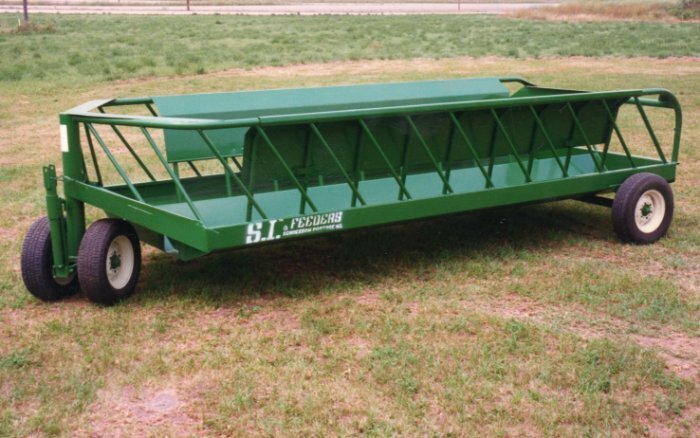 Tandem Axles are optional on all wagon lengths for added capacity, strenth and floatation. 12, 16, 20 and 24 foot wagons become 12 ton cap. 30 and 36 foot wagons become 15 ton cap. The stength of the Arrow Front® design allows S.I. to move the rear axle back which puts more weight on the front axle for safer towing and less problems on wet land. 2-way telescoping pole for easier hook-up. Keep pole in the long position at all times except when chopping. Fifth-wheel type steering plate provides more bearing surface and has a handy grease fitting. The height of the Arrow Front® feeder is designed to feed all livestock at a natural level for comfort and efficiency. Low Profile feeders can be ordered for shorter livestock.